A 4-year-old girl, previously healthy, presented with 3 days of cough, sore throat, and fevers. She had a chest radiograph at onset of symptoms, which showed right lower lobe pneumonia and pleural effusion, the latter confirmed by sonography. She was started on antibiotics, but had progressive dyspnea so she was transferred to Children’s Hospital for further management. On physical examination, she had tachycardia and frequent coughing, but was in no apparent distress. Her white blood count was slightly elevated (12,200) with an increased number of bands (41%). 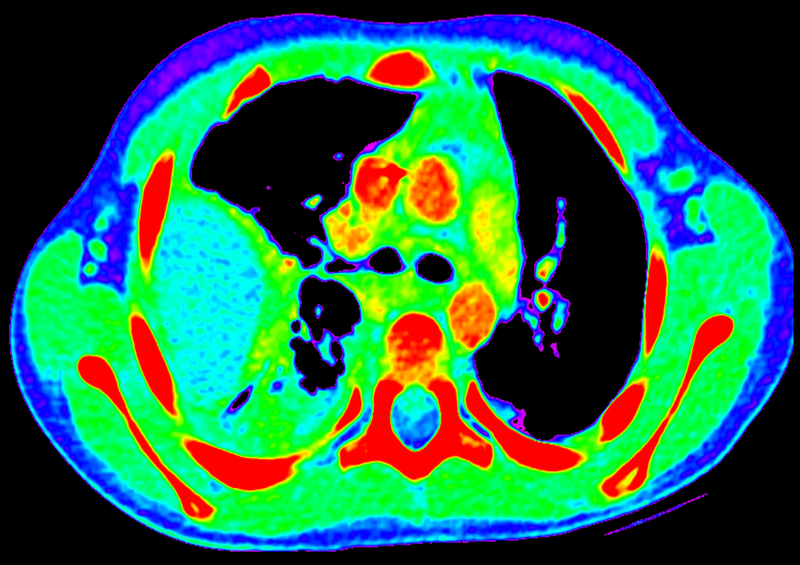 Since the patient was not responding to antibiotics, a computed tomography (CT) examination was performed to assess for complicated fluid collections or lung abscess. 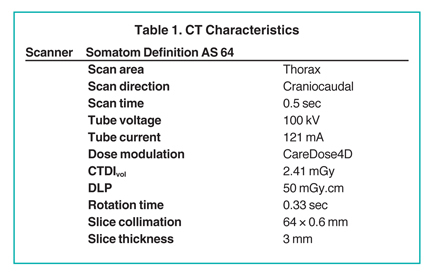 A CT examination was performed with a Somatom Definition 64 AS scanner (Siemens, Erlangen, Germany). This scanner has a dose reduction tool called CARE kV, which uses information gathered by the topogram to optimize kilovoltage (kVp) and milliamperage (mAs) so that a user-chosen contrast-to-noise ratio is maintained, and thus optimal image quality and lowest dose are achieved. 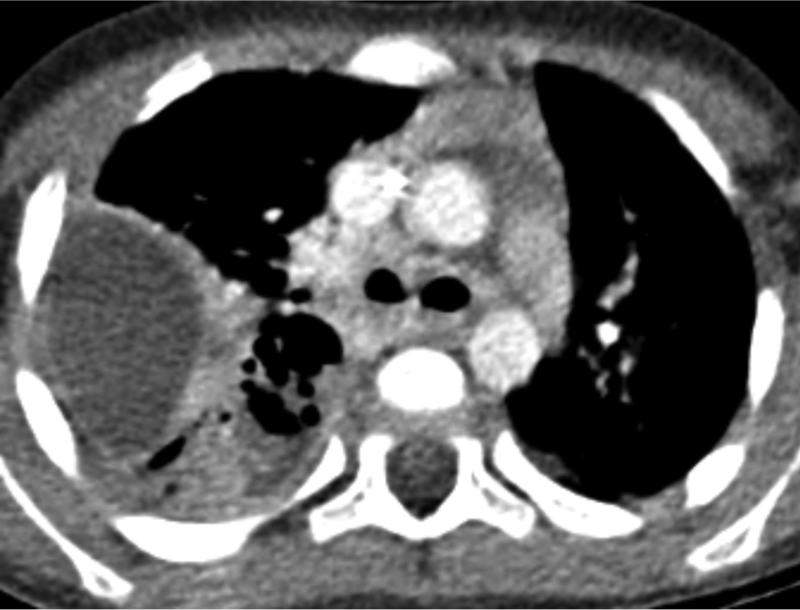 In this patient, the CT scan revealed multiple air-fluid-filled cavities within the consolidated right lower lobe (Figure 1). Other findings included a large right parapneumonic pleural effusion with enhancing margins consistent with empyema. Several small gas collections were present in the empyema related to the presence of a thoracostomy tube. The clinical course of community-acquired pneumonia in children is usually benign and responds well to conventional treatment. Occasionally, bacterial pneumonia is complicated by pleural effusion, empyema, lung abscess, pneumatocele, or necrotizing pneumonia (also termed cavitary pneumonia and pulmonary gangrene).1 Complicated pneumonias in children are commonly caused by bacterial pathogens, most often Staphylococcus aureus and Streptococcus pneumoniae. The differential diagnosis of cavitary pneumonia is lung abscess. Abscesses, unlike the cavities in necrotizing pneumonia, have thick, enhancing well-defined walls and may contain an air-fluid level. Lung abscesses are treated with antibiotics, and large abscesses may require percutaneous drainage. Percutaneous drainage of necrotic lung is not part of the treatment regimen. Necrotizing pneumonia is important to recognize because most children with this finding need to be hospitalized and require a more aggressive course of antibiotic therapy than do children with uncomplicated pneumonia. Most children recover completely with antibiotic therapy and chest tube drainage of empyema. Rare indications for surgical intervention include persistent bronchopleural fistula, loculated empyema, and lung entrapment. Outcome is usually excellent with normal lungs on long-term follow up imaging. 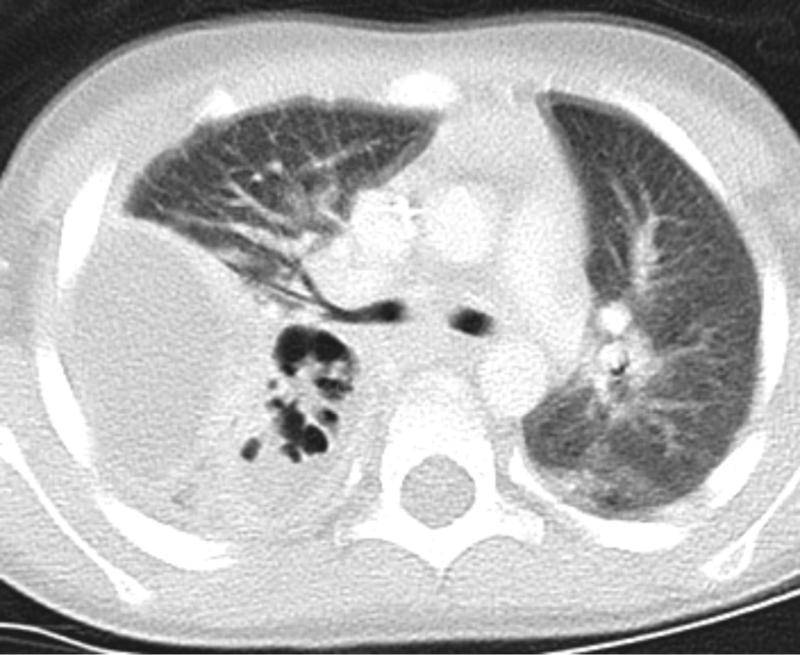 CT findings of necrotizing pneumonia include a variable number of air-filled cavities in areas of consolidated lung. Most children recover with conservative management with antibiotics and show no long-term sequelae of disease. Low-dose CT is the study of choice to document complicated pneumonia. Sawicki GS, Lu FL, Valim C, et al. Necrotising pneumonia is an increasingly detected complication of pneumonia in children. Eur Respir J. 2008;31:1285-1291. Hsieh YC, Hsiao CH, Tsao PN, et al. Necrotizing pneumococcal pneumonia in children: The role of pulmonary gangrene. Pediatr Pulmonol. 2006;41:623-629. Donnelly LF, Klosterman LA. Pneumonia in children: Decreased parenchymal contrast enhancement-CT sign of intense illness and impending cavitary necrosis. Radiology. 1997;205:817-820. Donnelly LF, Klosterman LA. The yield of CT of children who have complication pneumonia and noncontributory chest radiography. AJR Am J Roentgenol. 1998;170:1627-1631. Kendrick APT, Ling H, Subramaniam R, Joseph VT. The value of early CT in complicated childhood pneumonia. Pediatr Radiol. 2002;32:16-21. 4-year-old female with cough, sore throat, and fevers. Appl Radiol.